The rugged shell of the Ibanez MRB500C Road tour case protects your guitar from dents, scratches, dust and water. Ibanez bass guitar cases are ideal for players who want to transport their precious gear safely with road-tough protection, but also require a lighter case. Inside, MRB500C features a special mold design for accommodating many electric bass guitars and left-handed models. Moreover, the MRB500C Road tour case can even fit 4-string, 5-string and even 6-string models. 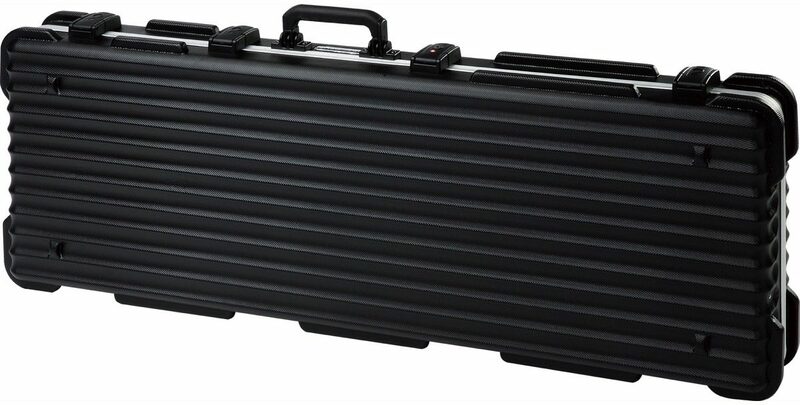 The MRB500C comes with its own Ibanez tool case and can be securely locked up while flying or traveling with it TSA-approved lock. - Interior Total Length: 46.7"
- Interior Lower Bout Length: 20.5"
- Interior Upper Bout Length: 10.7"
- Interior Lower Bout Width: 13.8"
- Interior Middle Bout Width: 3.0"
- Interior Upper Bout Width: 3.5"
- Interior Lower Bout Depth: 2.0"
- Interior Middle Bout Depth: 0.8"
- Interior Upper Bout Depth: 2.2"
Overall: I purchased this case for my Ibanez Premium SR2400E. Nice looking case with nice snug interior. Major flaw in this case. Ibanez you missed it. The corners of the case are hollow bumpers which cracked at the slightest bump to a wall. I have never seen a case crack so much asily doing the one job all my other cases have protected from. Corners. I am the utmostt careful with my gear and one bump to a wall and it split right after n the hollow thin cornered edge. The latches are a joke. Always having to pull them away from catching the inner edge and have to lift one up while the other gets stuck. Poor design and poor quality for a higher end case. Flimsy and easy to twist or rack the case and does not close easy.